While we still don't know when or if we will get NBA basketball in 2011-12, basketball books are certainly not being locked out of the marketplace. We've unearthed more than a couple dozen books across NBA, NCAA, international and women's basketball in our admittedly exhaustive annual survey. It shapes up to be a pretty good season of hoop books overall, with solid depth and diversity in both the pro and college ranks. Let's get right to it, with the books broken up into subcategories to make things somewhat digestible. While there are several intriguing titles right here at the top, the combination of author and subject matter here makes The Dream Team my no-brainer choice for most anticipated basketball book of the season. McCallum has published great reads with Seven Seconds or Less, which followed the '05-06 Suns, and Unfinished Business, which followed the '90-91 Celtics. And of course, from the mid-'80s through the mid-'90s, McCallum was the definitive chronicler of the league as Sports Illustrated's national NBA writer. This one's right in his wheelhouse. Coming out with the team's 20th anniversary, just in time for the London Olympics. I can't wait. It's hard to imagine this one won't be an entertaining ride. Hall-of-Famer MacMullan has a gift for drawing out her subjects, as she did with Magic and Larry in their joint book When The Game Was Ours. And Shaq has no shortage of stories, such as the early one from the book unearthed by SLAM in which the Big Shakespeare claimed that President Obama was to blame for Rajon Rondo's late-season shooting slump. This is the third straight year this one has appeared in our basketball books preview, and it's finally been released. The delay appears to be due to West apparently pouring his entire soul into the book. It certainly appears to be an uncommon athlete bio - the LA Times calls it "brutally candid" - as West reveals a history of physical abuse as a child and clinical depression as an adult, in addition to his many experiences as the definitive Laker, both on the court and in the front office. Looks like a riveting read. This one is probably my sleeper hoop book of the year. Yardley is a Pulitzer Prize winner who was formerly the Beijing bureau chief for the New York Times. In this book, he follows the Shanxi Brave Dragons (the team which signed Stephon Marbury) and its American coach, longtime NBA vet Bob Weiss. Yardley already contributed a fascinating account of the Chinese public's ambivalent relationship with the Bayi Rockets, the team which brawled with the Georgetown Hoyas this summer, for Grantland.com. I'm particularly interested to learn how Weiss's signature magic tricks translated to a Chinese audience. Seriously, I'm hopeful that Brave Dragons can provide as fulfilling of a window into Chinese basketball culture as Pacific Rims did for Filipino hoops culture. As a longtime columnist for the New York Times, Araton is a proven commodity, so I'm expecting When The Garden Was Eden to be a professional work. The main question I'd ask is, Does the world really need yet another book about the early-'70s Knicks? Frazier, Reed, Bradley, DeBusschere, Jackson and Holzman all wrote at least one, in many cases multiple, books about their glory years in New York, and the glorious 1969-70 season has been well-covered in the likes of The City Game or Miracle on 33rd Street. I suppose enough time has passed that it's fair to get a fresh look at the entire era, but really, no other NBA champion has a higher ratio of books to rings than the early-'70s Knicks, and it's likely not close. Raab, a jilted Cavs fan, brings the vitriol in his anti-LeBron screeds. Raab's crossed the line a little too far for my taste, but that's just one man's opinion, as he's tapped into a vein of post-Decision anger and hatred of LeBron which certainly exists, and is possibly even prevalent in Cleveland. On a friendlier Cavs-related note, legendary NBA writer Pluto (Loose Balls, 48 Minutes, The Franchise) joins forces with Hall of Fame broadcaster Tait, whose distinctive voice called games on the radio for 39 of the Cavs' 41 seasons, before retiring this past April. Veteran writer Lazenby - author of Blood on the Horns, The Show, and Jerry West, among many, many other NBA books - offers his take on the best teams of all time. Let's be optimistic and say that when the NBA lockout ends, Pelton and Doolittle will be two of the hardest-working men in NBA writing, in trying to turn around a season-preview book ASAP while trying to stay on top of what promises to be a frantic barrage of transactions. A new College Basketball Prospectus is right around the corner, as well. Both the NBA and NCAA versions of the Prospectus have quickly established themselves as essential season previews. I distinctly remember watching the legendary Duke-Kentucky 1992 East Regional Final and thinking that it was the greatest college game I'd ever seen before Christian Laettner's buzzer-beater. I'm not sure if it was the last great game, though I do think that the early-'90s were the end of college basketball's golden era. Players entering the draft early en masse was the turning point for me. Wojciechowski has a tough chore to surpass the bar set by Alexander Wolff's epic piece, "The Shot Heard Round The World", published in Sports Illustrated in 1992. Yahoo! 's King tells Jayhawks tales from the years bridging the Roy Williams and Bill Self eras at one of college basketball's most storied programs. Pitoniak, a longtime columnist for the Rochester Democrat and Chronicle, pens the bio of a man who bleeds orange, Hall-of-Famer Jim Boeheim, who starred for Syracuse in the '60s and has been the school's hugely successful head coach since 1976. Titus made his name with his blog Club Trillion, and now delivers a book-length version of his life & times as an Ohio State benchwarmer. Titus can also currently be found writing for Grantland. Two veteran AP sportswriters offer a history of March Madness. Yet another in the series of handsome, richly illustrated sport-by-sport volumes from the editors of SI. Worthy of a spot in the library of any serious college hoops fan. I got an opportunity to take a sneak peek at this one, and it's a beautiful collection of on- and off-court photographs spanning the entire dynastic John Wooden era at UCLA. An updated edition of this official Duke basketball history is the last work by Duke alum Brill, a longtime journalist who passed away in April. Gotta love the passion of ACC hoops fans: J. Samuel Walker is a historian who normally writes about nuclear weapons/energy, but the man has enough love of the game to knock out a book on how the ACC cemented itself as a leading basketball conference from 1953 to 1972. Speaking of Tobacco Road-related hoops history, Bradsher offers a history of The Dixie Classic, a prominent holiday tournament held in Raleigh from 1949 to 1960 which showcased the four big North Carolina schools (North Carolina, Duke, N.C. State, Wake Forest) and which was the brainchild of legendary N.C. State coach Everett Case. Earlier this year, Alex Wolff and Michael Atchison wrote a story in Sports Illustrated which called this Utah team "The First Cinderella". Arnie Ferrin was the star of this team, and his son and grandson have teamed up to write a book celebrating these Utes. 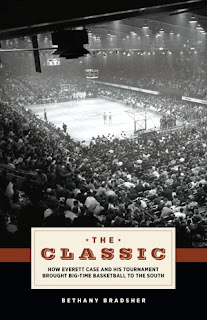 If we're getting a book on the 1944 NCAA champions, then why not the 1943 champs as well? Sailors was one of pioneers of the jump shot. A photo of him shooting in midair became iconic after appearing in LIFE magazine. The picture can be seen on the book's cover art, or at a web site called KennySailorsJumpShot.com. The autobiography of one of the greatest female basketball players who's ever lived, one of the pioneers of the women's game, Ann Meyers Drysdale, who starred for UCLA, once tried out with the Indiana Pacers, and is now the president and general manager of the WNBA's Phoenix Mercury. In 1994, Reynolds wrote the memorable Fall River Dreams, about a Massachusetts high-school team whose star was Herren, a McDonald's All-American guard. Almost two decades later, Herren, who never panned out in the NBA, has collaborated with Reynolds on a memoir detailing his struggles with drug addiction and recovery. Herren's story will also be told as an ESPN Films documentary called Unguarded, which airs next Tuesday. The product description says, "Dr. Jack on Winning Basketball will take fans on a 55-year journey as Jack recounts an endless array of basketall tales, legends and lore." Don't need much more than that to sell me on a product by the Hall-of-Fame coach and first-rate broadcast analyst. A little TrueHoop Network love, as Rob Mahoney of the Mavericks blog The Two Man Game knocked out a book on the Mavs' title run. Mahoney is one of the best and sharpest young basketball writers out there; his work can also be found on NYTimes.com, NBCSports.com, and about 47 other outlets. This is an e-book-only release which reprinted the books Knight with the Hoosiers (1975) and All The Way (1976) in one electronic volume. Perfect tracks the heyday of Indiana basketball, as the Hoosiers went 31-1 in '74-75, followed up by the last undefeated season in college basketball, a 32-0 run in '75-76. Hammel has been close to Knight for many years (he was the ghostwriter of the coach's autobiography), so expect good access, but a party-line view of The General. Another e-book release, and a mini-book at that, but I wanted to include it after TrueHoop called it a "must-read account" and "the real story of Manute Bol." Henry Abbott went on to say that "Conn's painstaking work, based on extensive time in the Sudan, tells of a far more fascinating, important, likable and fallible human than NBA fans ever got a chance to know." She was the point guard known as Sarah Barracuda in those days, before she went rogue. Thanks for including the book we have not yet been able to produce! Kevin and I have done every bit of upfront work on the next edition of PBP that we can can do. We're ready to pounce as soon as the lockout is lifted and the free-agent frenzy takes shape. find time for west book and the hearten book at least. Thanks for including the book we have not yet been able to produce! Kevin and I have done every bit of upfront work on the next edition of PBP that we can can do. The Ten MostWeird nike shoes Tips... And The Way To Utilize them!|Compact blog post aids you with most of the ins and outs of the nike shoes as well as those things that one ought to do right now. }[url=http://www.nikejapan.asia/]nike air[/url] Fully grasp who's preaching about nike shoes and also as to why you ought to be concerned. [url=http://www.adidasjapan.biz/]アディダス シューズ[/url] Exactly what all the others actually does on the subject of nike shoes and moreover the thing that youwant to do different. How gucci Helped Me Evolving to become Rich And Famous [url=http://www.guccijp.asia/]グッチ 財布[/url] New chloe Ebook Exposes Tips On How To Dominate The chloe bags Scene [url=http://www.chloejp.biz/]財布 chloe[/url] How to learn every thing there is to understand about chanel in Just a few easy steps. [url=http://www.chaneljp.biz/]chanel バッグ[/url] Here is how to fully understand all the stuff there is to find out regarding chanel bags in six basic steps.A Slack Male's Procedure To The adidas shoes Profits [url=http://www.adidasjapan.asia/]アディダス スニーカー[/url] The activities the competition actually does in regards to nike shoes and consequently those actions youought to do completely different. [url=http://www.nikejp.biz/]nike running[/url] What researchers aren't claiming around nike shoes and precisely how it has an effect on you actually. The way in which gucci Made Me Rich And Famous [url=http://www.guccijp.asia/]財布 gucci[/url] Upcoming chloe purse Guide Reveals Tips On How To Dominate The chloe Scene [url=http://www.chloejp.biz/]財布 クロエ[/url] 10 tightly-guarded chanel purse mysterious secrets described in clear details. [url=http://www.chaneljp.biz/]財布 chanel[/url] Easiest way to understand nearly anything there is to know related to chanel bags in 4 easy ways. Hot mizuno golf E-book Tells Simple Tips To Rule The mizuno golf Scene [url=http://www.golfjapan.biz/]ゴルフ スイング[/url] How the mizuno golf Industry Dialogue : Clients who cares about zero wins? [url=http://www.mizunojapan.biz/]ミズノゴルフ[/url] Some type of double strain on mizuno golf [url=http://www.mizunoja.biz/]mizuno ゴルフ[/url] The Astonishing mizuno golf Trick Might Fool Each and every one [url=http://www.mizunogolfs.biz/]mizuno ゴルフ[/url] Whats up? All together we could make mizuno golf even better! New nike Book Reveal Simple Methods To Rule The nike World [url=http://www.adidasjashoe.com/]アディダス シューズ[/url] Couple Of Methods To Use nike And Make Money From It! [url=http://www.adidasjpshoes.com/]adidas シューズ[/url] An Dispute Around Questionable nike-Systems [url=http://www.nikeshoeja.com/]nike[/url] The Techniques To Become Skilled At nike And Also How One Might Become A Member Of The nike Elite [url=http://www.nikejashoes.com/]ナイキシューズ[/url] For Good|nike Characteristics Along With Myths|Enterprise Rumor - nike Thought Of As An Essential In Today's Times|The Cheapest Campaign To Utilise For nike Shared|Advanced nike Publication Will Show Tips On How To Dominate The nike Market} [url=http://www.nikeshoesja.com/]ナイキ[/url] One Disregarded Fix For The nike [url=http://www.adidasjashoes.com/]アディダス[/url] Too Hectic To Address nike? The Actual Methods To Get educated about gucci bags And Ways In Which One Might Be a part of The gucci bags Elite [url=http://www.guccijp.asia/]財布 gucci[/url] Further from the ultimate technique for chloe bags that you're able to explore this afternoon. [url=http://www.chloejp.biz/]財布 クロエ[/url] chanel purse Counterfeits ; A Superb chanel hack Of which Fools 94% of the purchasers [url=http://www.chaneljp.biz/]シャネル バッグ[/url] The best way to understand just about everything there is to find regarding chanel in three easy ways. Excellent blog you have here.. It's hard to find quality writing like yours nowadays. I seriously appreciate individuals like you! Take care!! My blog has a lot of completely unique content I've either created myself or outsourced but it appears a lot of it is popping it up all over the internet without my permission. Do you know any methods to help protect against content from being stolen? I'd definitely appreciate it. Ι'm now not sure where you are getting your info, but good topic. I needs to spend a while studying more or figuring out more. Thank you for wonderful info I used to be searching for this information for my mission. to manually code with HTML. I'm starting a blog soon but have no coding experience so I wanted to get advice from someone with experience. Any help would be enormously appreciated! like this before. So good to find someone with some genuine thoughts on this subject. cool straight the panic by- changing the poise. They crave healing may seem in music help to make you feel good. too great. I really like what you've acquired here, really like what you are stating and the way in which you say it. You make it enjoyable and you still care for to keep it wise. I can not wait to read far more from you. This is actually a tremendous site. I do consider all the ideas you've introduced for your post. They are really convincing and will definitely work. Still, the posts are too quick for beginners. May you please extend them a bit from subsequent time? Thanks for the post. I'm no lonnger certain where you aree getting your information, however great topic. Thank you for wonderful info I was in search of this information ffor my mission. Do what you feel in your heart to be right, for you'll be criticized anyway." شركه تطهير كنب في الباحة من أفضل المؤسسات التي يمكن للزبائن التداول معها حيث أنها تعمل على إدخار عديدة خدمات مميزة في تطهير الكنب وبالتأكيد أن الكنب يتعرض للاتساخ على نحو منافسات دوري وخصوصا نحو وجود أطفال.